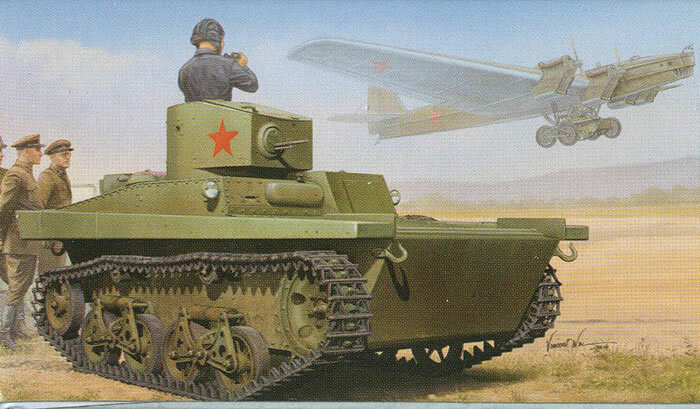 Of all of the early Soviet tank designers, probably the luckiest man of the lot was Nikolay Aleksandrovich Astrov. He was a promising young engineer at a lamp factory in Moscow when he was arrested as an “enemy of the people” in 1929. Sent to the formidable Butyrskiy Prison, he was soon fortunate enough to be sent to what the Soviets called a “Sharashka” - a design bureau working for the OGPU that provided better treatment than the prisons did. While there he showed a flair for armor design by creating the PT-1 and PT-1A amphibious tanks; while they were not accepted it did lead to his release from prison in 1934 and return to more serious tasks of tank design. This kit is a state-of-the-art kit with a one piece hull tub and one piece turret shell with first-rate molding. While it unfortunately retains the concept of single link tracks, they are crisply molded on seven sprues and foam packing is provided between each sprue to protect the delicate teeth on the links. Three finishing schemes are offered, all in 4BO dark green: parade vehicle with red stars; white band across turret and white square with black 1 inside it; and wargame markings with white bands on the four sides of the turret (front/back/left/right) with two yellow marking bands. A small sheet of decals is provided for them. Overall this is a really nice kit but for tracks this petite HobbyBoss should think about link-and-length configurations.